Firstly, apologies that the blog hasn't posted anything in a little while. Due to a hefty bout of "man flu" on my part and then sudden arrival of Christmas on the horizon, I have not been able to find the time to sit quietly and type away about chickens, a pastime of which I am particularly fond. In a few short weeks it will be my birthday. I tell you this not to illicit felicitations on my turning the ripe old age of twenty eight, but to highlight the point that it doesn't seem twelve months since I blew out the candles on my twenty seventh birthday cake! 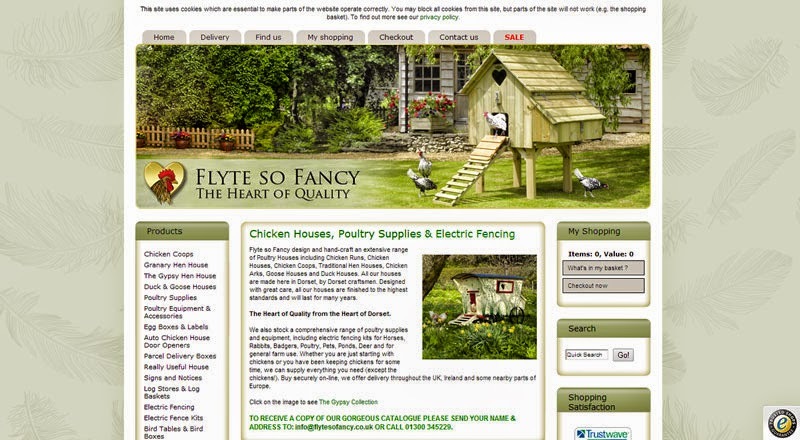 Indeed, another year has whizzed by here at Flyte so Fancy and so this week the blog is going to have a look back at some of the highlights of 2014 (and of course the real stars of the show the FSF flock of chickens, ducks, geese and guinea fowl). As Flyte so Fancy moves into its teenage years, like most teenagers it decided to grow up a bit and get a new look. With its new elegant grey green colour scheme, it certainly does look grown up and with its handy new features like PayPal Express checkout and superior searching function it has been proving a hit with customers all year long. March saw the arrival of new chicks in the FSF chicken field and a new beautiful hen house, The Fantasia. With its fairy tale design, the gentle fade of its sides and compound tiled curved roof, this hen house is really finished off by the intricate painting available of its interlocking creeping pink roses, like something from Sleeping Beauty. 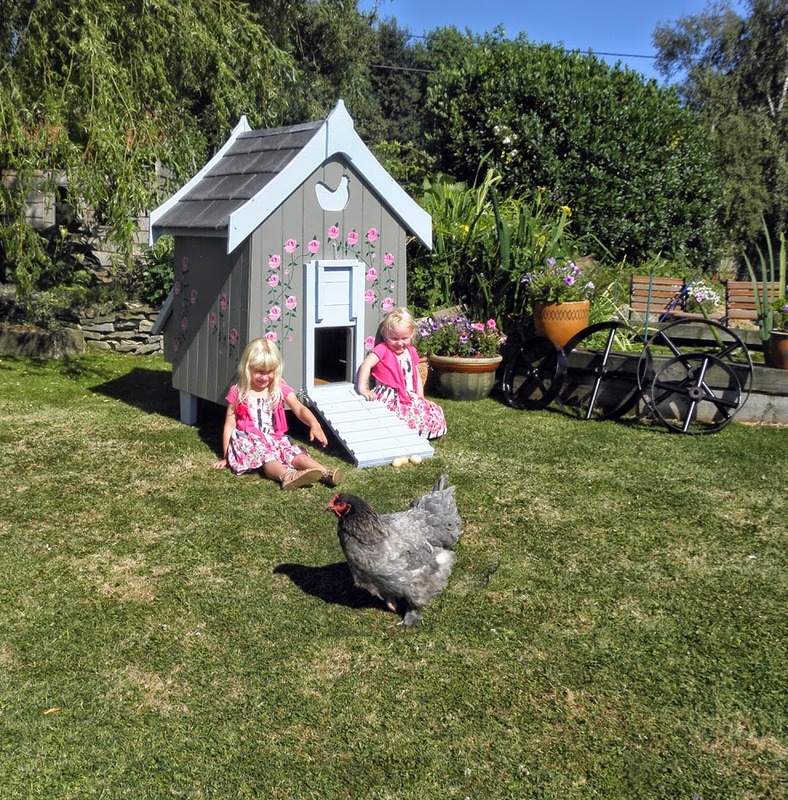 Built with all the usual practical features Flyte so Fancy houses have, the Fantasia Hen House has received great interest and delight from all who have seen it. As the summer really got going in June we saw our duck population double as we had some Cayuga/Cherry Valley cross ducklings hatch out from a clutch of eggs. Quickly becoming my favourites, it wasn't long before the workshop had constructed a new Floating Duck Lodge for the middle of the FSF pond, to be their new home. 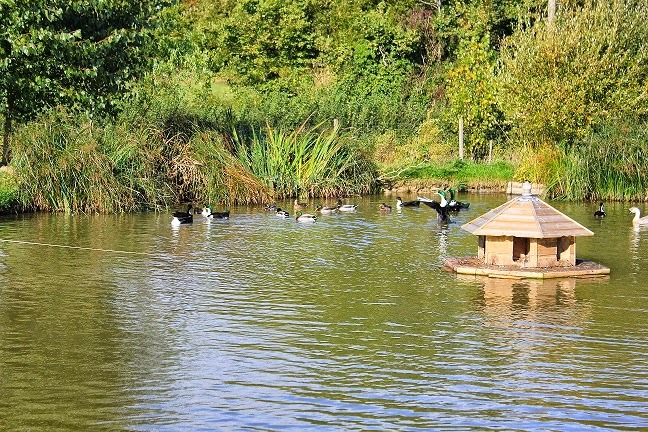 A hexagonal house, with six nesting areas, the duck lodge is a grand penthouse by the pool for ducks to while away the day. The Boss Phill has always maintained that the duck floats are buoyant enough to support a full grown man and it was with some trepidation that our burly 6ft 2inch Operations Manager Richard, stepped out on to the float, in a leap of faith in the workshops ability. On hand to film the scene I will admit that I was somewhat sad not to see Richard plunge head first into the duck pond, you cant help but agree that the duck floats really are buoyant. Towards the end of summer, myself and Richard headed out on the lawn on a particularly hot summers day, armed with only our wits, some ice lollies and a screwdriver to film the building of a Poultry Protection Pen. Arriving in pre-drilled flat packed panels, the Protection Pens are so easy to build you can have them together within a half hour. It didn't take long and with the footage back in the office and with the Boss Phill recording a commentary for the video, if you are looking for a pen to enclose your hens in, it is well worth a watch to see just how brilliant the Poultry Protection Pen is. In the background of everything that has been going on throughout 2014 is the retirement of Phill's old garage at the bottom of the garden as the FSF workshop and the construction of an all singing all dancing one next door. Well, one that doesn't rain on top of our workshop teams heads every time there is a shower anyway. 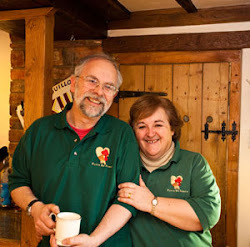 Ensconced in their new workshop, the team is as happy as Larry and busily working away building hen houses, log stores and garden stores at a tremendous speed. As I gear myself up for the great task of present wrapping (anything beyond a precisely square box eludes me) here at Flyte so Fancy HQ we are preparing for winter, making sure that our flock have an extra deep layer of HempBed-E in the coop to keep the chill from the feathers and making sure everything is ready for 2015. It's not that far away! A Very Merry Christmas to You and a Happy New Year!